She brought light into my world of shadows. Even as a kid, I knew the kind of hell the world could dish out. I grew to expect the worst and learned to face it head on. When I became Satan’s Fury’s new enforcer, I knew I could handle whatever came my way–until Alex Carpenter, the gorgeous book store owner who brought color into my world of gray. The club was at war, fighting an unknown enemy, and she was a distraction I didn’t need nor want. My focus should’ve been on my brothers and our latest adversary, but I felt an unexplainable pull towards her. Her beauty and innocence captivated me, and just being near her made the shadows of my past seem less daunting. I let her in, but as we grew closer, I quickly realized that her walls were even more guarded than my own. Like me, Alex had a past filled with secrets. Could our broken souls find a way to mend together, or would we remain imprisoned by our past? Shadow is book two of the Satan’s Fury MC- Memphis Chapter. This full-length standalone novel is intended for mature audiences only due to the explicit language and violence. Contains no cheating and a swoon-worthy HEA. WOW WOW WOW! 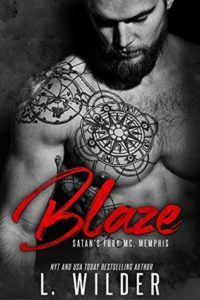 The Satan’s Fury MC Memphis Chapter just keeps getting better and better and may I just add that Ms. Wilder definitely knows how to spin a MC Web. 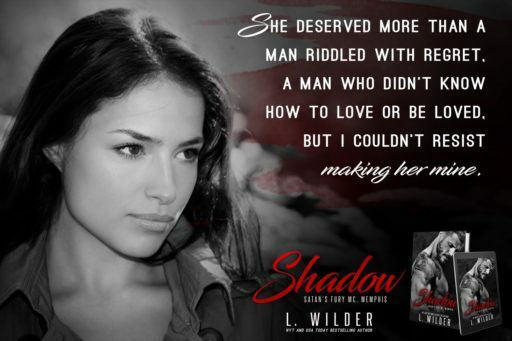 Shadow as well as the series is full of MC action, suspense, intrigue and romance. The characters are so charismatic that they will have you feeding off every word and action. Shadow is the enforcer for his MC. He uses that position to help fight his inner demon. Yet he’s still troubled by nightmares and flashbacks. He’s given up on ever feeling total peace or any kind of tenderness in his life. That is until he walks into a bookstore downtown. Something about the place gives him a sense of calm like he hasn’t known since he was a small child. So everyday he stops in, has a cup of coffee and sits and reads for a bit. But one day, he bumps into the the owner, a shy girl named Alex that Shadow can see in her face, has secrets of her own. There is an instant pull between them. But both know inside that they can’t let it amount to anything for their own personal reasons. But sometimes the pull is stronger than one’s inner will. This is a fast paced exciting story that will keep you on edge (both the OMG sitting on the seat of your pant edge and the hoping for any type of HEA edge). The author has done a phenomenal job with Shadow, making the series even more exciting. I can’t recommend this book and the series enough. I Highly suggest grabbing up both Blaze (book 1) and Shadow (book 2) and start the series ASAP. You won’t be sorry you did! Leslie Wilder grew up in a small town in West Tennessee. A country girl at heart, she’s always thought that life is too short, but she had no idea how short it really was until her brother passed away in 2014. She’s always been an avid reader, loving the escape only a great book can give, and wondered if she had what it took to write one of the wild romances she’d come to adore. With the support of her family and friends, she published Inferno: A Devil Chaser’s MC, one year after her brother’s death. With him in mind, she fulfilled her lifetime dream of writing. Since then, she’s completed the Devil Chaser’s Series and continued on with the Satan’s Fury MC Series. She has so many stories in her head, and can’t wait to share each and every one. Leslie has been blown away by the support of her readers, appreciating every message, review, and encouraging word she’s received over the past year. She looks forward to continuing this journey with them for years to come. Learn about new releases and the author news. MissingClientTokenId: Request must contain AWSAccessKeyId. Chad Henderson and Jon Lasiter were best friends and business partners. Their taste in women always caused a problem.